General Motors Dealers are Vanishing! Sad, but true… Many GM and, of course, Saturn Dealerships and Repair shops are closed or closing. If you are you looking for a reputable Independent General Motors garage located in Claremont, Montclair, Upland, or the surrounding communities because your shop is “no longer…,” or you just aren’t satisfied with your current dealer, current independent, or you’ve recently relocated – consider Orr Automotive. 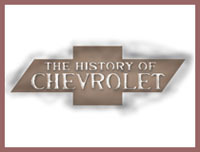 Chevrolet was founded a century ago in 1910. Because of the economic turmoil, the Chevrolet brand is currently undergoing a restructuring in North America along with all other GM brands. Saturn, for example was discontinued as a GM Brand. Many of our customers know first hand that General Motors has recently been active in reducing its number of dealerships, and has left many customers seeking quality Independent Auto Repair alternatives. You have a quality alternative at Orr Automotive in San Bernardino at reasonable prices. Orr Automotive is your auto repair garage for quality, affordable Chevy Repair in the the Shadows of the Mountains. 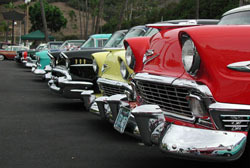 Chevrolet, Buick, Cadillac, Pontiac, Saturn, and GMC maintenance is very important for the life of your car. Orr Automotive can maintain your car so that your vehicle has the best possible chance of lasting a long time. When you take care of your car, your car will take care of you. Orr Automotive handles all types of repairs for these General Motors Brands. 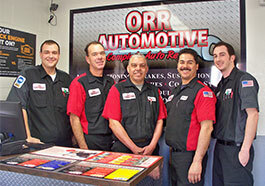 Orr Automotive is a full service, professional auto-repair garage in business since the 1980′s. We provide major service, timing belts, brakes, air conditioning, tune ups, shocks and struts, and much more! Orr Automotive for your GM Repairs. Here is a short list of what we can do for your General Motors car or truck. Our work is just as good as the General Motor’s Dealer’s but for less money and more personal service! At Orr Automotive, are goal is to fix your car right and get you back behind the wheel so you can enjoy your vehicle.